The Siberian Forest Cat (Siberian) is the National Cat of Russia. It is an aboriginal breed with unknown origins. The natural breed has existed there for hundreds of years. There is documented history of the Siberian as early as the year 1000. It is a cat from which many fairy tales have been derived. After living in the cold Russian climate for generations, the Siberian developed a hardy constitution. In order to survive the harsh conditions, they developed a dense triple fur coat that is water resistant. Siberians are not true shedders, nor does their coat mat. The first Siberian Forest Cat was imported to Australia by Marie Mahoney of Miakoschka. 70-90% of people who are allergic to cats will most likely be able to live with a Siberian in their home. Most cats produce protiens and this causes allergies. This protien produced by cats is called Fel-Dhi and causes 85% of the allergies that people who are allergic to cats suffer. 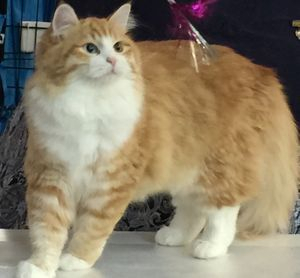 The Siberian produces far less Fel-Dhi than the average cat. A normal cat produces about 63,000 micrograms of Fel-Dhi compared to about 200 micrograms produced by a female Siberian. The majestic Siberian is a strong, powerfully built cat with strong hindquarters helping them to jump exceptionally high. They are a slow-maturing breed reaching full magnificence at about 3 to 5 years of age. Siberians are large cats with a substantial rounded body reminicent of a barrel and heavily boned legs to support the substantial body structure. But for all their powerful strength, these are gentle cats that enjoy playing and clowning around with their families. 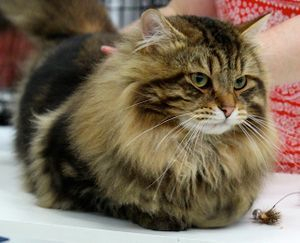 The Siberian Cat's body is strong, solid and snappy. Their hind legs are slightly longer than their front legs giving them the powerful lift they need to get to those high places they just have to reach! The neck and back are broad and muscular, medium length legs with round paws, between the toes well tassels. Their large eyes are almost, but not quite, round and will appear rounder when the cat is alert or startled. The gender difference is clear: the female weighs about 3.5 to 4.5 kg and the male about 5 to 8 kg. The Siberian presents a powerful and striking first impression. Siberians use their incredible intelligence to solve all kinds of problems, like determining how to open a door to be with the owners they adore, how to get to the cat food for an extra meal, or how to recover that favourite toy that their owner thinks they have so cleverly hidden out of reach! They are powerful agile cats that can leap great distances and heights, sometimes appearing to fly through the air, but despite their size, they are adept at negotiating obstacles in their path without knocking them over. At the same time, they love to play and will entertain you with their clown-like antics. They adore their human families and their visitors, with children holding a warm spot in their hearts. Siberian cats are easily trained. The Siberian loves to fetch their favourite toy. They have a wonderful depth to their purr and talk to you with a chirping sound, particularly when they are coming to greet you when you have been out. Siberian cats have a fabulous fur coat. While considered a semi-longhair, the Siberian's coat varies with the season. In the winter, it will have a thick, rich, full, triple coat that would have protected it from the elements in its native Russia. They come in a wide variety of colors and patterns, with deep intense colors and rich patterns that make them a dramatic standout from the everyday cat. Siberian cats are very easy to interpret. They are expressive and seek contact with a look. They express all their feelings in a transparent and comprehensible manner: kisses, gentle nibbles and head-butts.